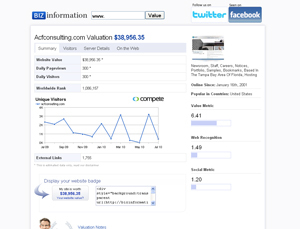 ACF Consulting Blog: Where Does your Website Stand? Keeping track of your websites traffic is important. We’ve mentioned Google Analytics in a previous post, but there are lots of other tools available online that allow you to track different statistics that can be useful when promoting your website. 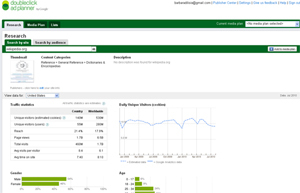 Below outlines some popular website tracking tools and explains their uses. Alexa offers free traffic metrics, search analytics and demographic information on your website. 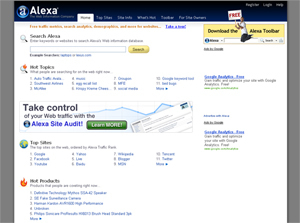 The more popular your website is, the lower your Alexa ranking number will be. Alexa provides data similar to Google Analytics, but also gives demographic information about the people visiting your site, which can be very helpful in making sure your site is reaching your target market. 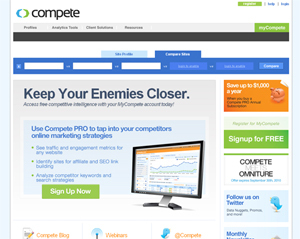 Compete lets you see how your site matches up to your competition. Simply type in your URL and the URL of one of your competitors and you’ll get a chart of your pageviews compared to the other site as well as a list of both sites popular keywords. Although most of the information is free, some features require you to sign up for a Pro account. Were you planning on advertising on other websites? Then Google AdPlanner is for you. AdPlanner shows you statistics of popular websites so you can determine whether or not it would be worth it for you to advertise there. Stats like number of pageviews, audience interests, and other sites people have visited are all available with AdPlanner and can really help determine whether your site is the right advertising fit. This website estimates how much your site is worth based on the number of external links, pages and submissions to social bookmarking sites. Enter in your URL and find out how much you’re worth! All of the above are great resources to examine how, when and where website traffic is coming from. You can find out information about your site as well as learn how you measure up to competitors. Are you not sure what all this information means? Need help understanding how to make your site better? We can help! If you have a question, feel free to ask it in the comments or contact us!